2019, Brazen-Faced Varlets, Buffalo, NY. 2019, Agnes Irwin School, Bryn Mawr, PA.
2019, Biennale College Teatro 2019, La Biennale di Venezia. 2018, Baton Rouge Magnet High School, Baton Rouge, LA. 2018 Rescued From the Mess, Ashtabula, OH. 2018 Stephens College, Warehouse Theatre, Columbia, MO. Nominated for New York Innovative Theatre Awards. Crossroads School, Santa Monica, CA. Another Country Productions, (reading) Boston. Echo Theatre (reading), Dallas, TX. Women’s Theatre Project, Ft. Lauderdale, FL. National finalist, Jane Chambers Award, Association for Theatre in Higher Education. Published by Samuel French, Inc., NYC. Subject of feature article in The Washington Post. Excerpted in The Best Women's Stage Monologues of 2003. (Smith & Kraus). “… powerful new play… thoughtfully written...” --San Diego Lesbian Press, CA. “The Anastasia Trials is many things—farce, social history, debate play, agitprop, audience-participation melodrama, satire… makes the head reel!” --San Diego Union-Tribune. "Four Stars"-- Buffalo News, NY. "Our Saturday show was over sold out (which hasn’t happened since 2007 at our student run theatre) we had to add so many chairs to audience that the actors had to adjust to their stage space. Here is a quote from our Chairwoman who also played Diane-Erika Wilson, 'The one word we kept hearing was 'relevant.' Every audience we had was engaged because the issues in this show are so pertinent to what is going on in our country right now. We, as the Warehouse, were so pleased with this show because we could see people really thinking, and we heard them talking about the show even as they left the theatre.' I saw the show the same day Kavanaugh was confirmed. The speech at the end when Diane talks about the rights of the victims and survivors the women who have been silenced and censored etc… it was moving to hear these words echo what’s happening in the world around us." -- Lili Javorka Dramaturg and Performance Liaison, Stephens College. 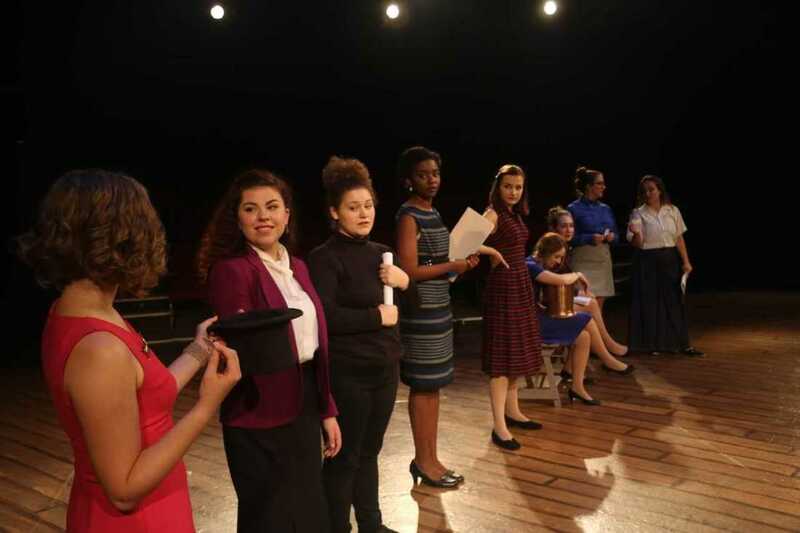 The Anastasia Trials in the Court of Women makes theatre history with an interactive courtroom drama that engages the audience to serve as both judge and jury. The play is shaped by the audience decisions to overrule or sustain the attorneys’ motions, and every night’s audience sees a different play. The Anastasia Trials is a farcical, but profoundly engaging excursion into the hidden world of ethics for women who are both survivors and perpetrators of abuse toward women. The format is a play-within-a-play, where a radical feminist theatre company comes together in order to perform a courtroom drama. In presenting the play, the Emma Goldman Theatre Brigade has instituted a new system to insure equal opportunity for the actors: a lottery. As the women assemble to draw their roles from the hat for the evening’s performance, sisterhood is put to the test. The performance itself is a conspiracy trial against five women accused of denying a woman her identity. The plaintiff is none other than Anastasia Romanov, sole survivor of the massacre of the Russian imperial family in 1918. The audience is required to serve as judge and jury for the case, providing both rulings on the motions and the final verdict. The Anastasia Trials in the Court of Women requires intense audience participation, and the question of women betraying women is called for every member of the audience. 'The Anastasia Trials in the Court of Women: An Interactive Comedy in Two Acts' by Karla Mantilla, in off our backs,, May/June 2003. 'Theater Magic: The Trials and Tribulations of Producing Women's Theater' by Jade Angelica, in The Portland Phoenix,, Februrary 14 - 21, 2002. 'Women, Holding the Cards; 'The Anastasia Trials in the Court of Women' by Dan Via, in The Washington Post,, May 30, 2003. 'Theater Review: The Anastasia Trials in the Court of Women' by Robert Barry Francos in 'FFanzeen,' December 5, 2008. Turning the Tables' by Martin Brady in Nashville Scene, September 2004.